So I read on a fellow LA foodblogger (Eating L.A.) that this past Saturday was the Sri Lankan festival at Santa Monica's Third Street Promenade. I've never had Sri Lankan food before, so I took this opportunity and went. They've set up tents all along the promenade. 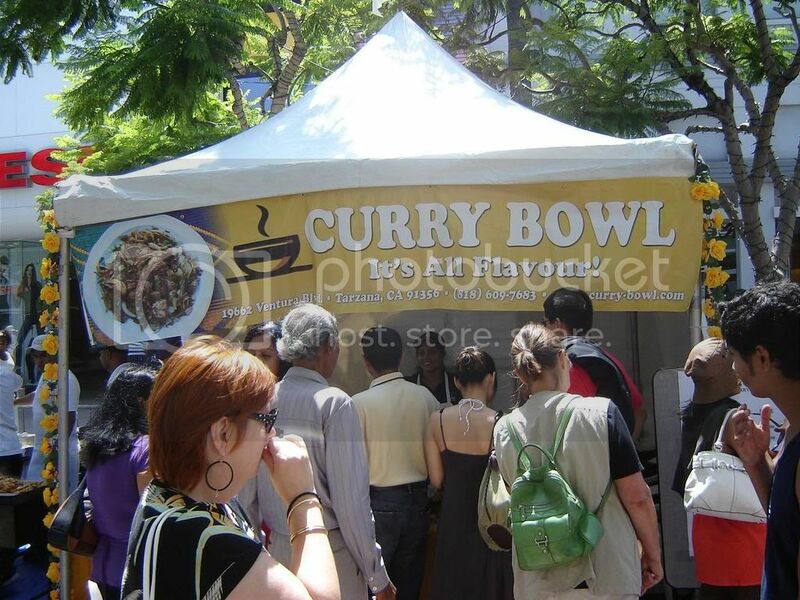 One of the popular booths was this Curry Bowl, that lists a Tarzana address (in case anyone is interested in going there). Seeing someone preparing the food really attracts a lot of attention. 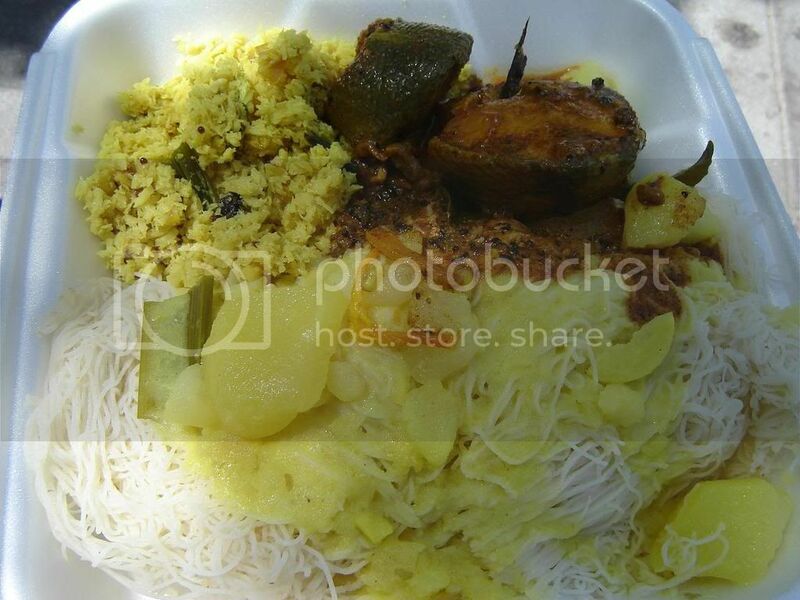 We saw them making this "kottu roti" and, of course, decided that we should get some. 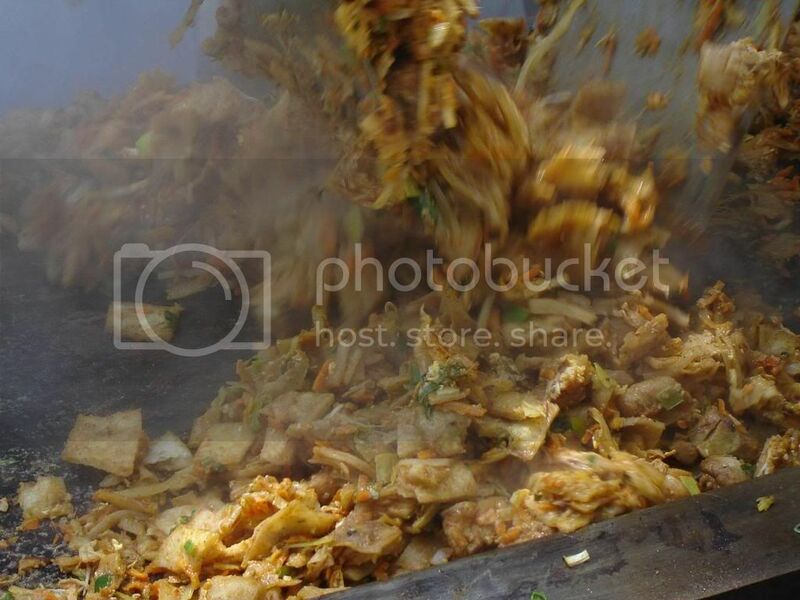 Kottu roti is made from 'roti' (flour dough), chicken, and vegetables, all chopped up. "Ready to eat!" was what they were aiming for. This somewhat reminds me of pad see ew and the like, but a slightly spicier version (not too spicy though). The roti is very doughy in comparison also, a lot more doughy than what I'm used to and it made it very filling. The yellow stuff on the top left is coconut, then to the right is some fish - according to the girl it was salmon although it sure doesn't look like it to me - a little spicy but not too bad. The strings were again, kind of doughy. I guess that's the way they like it? 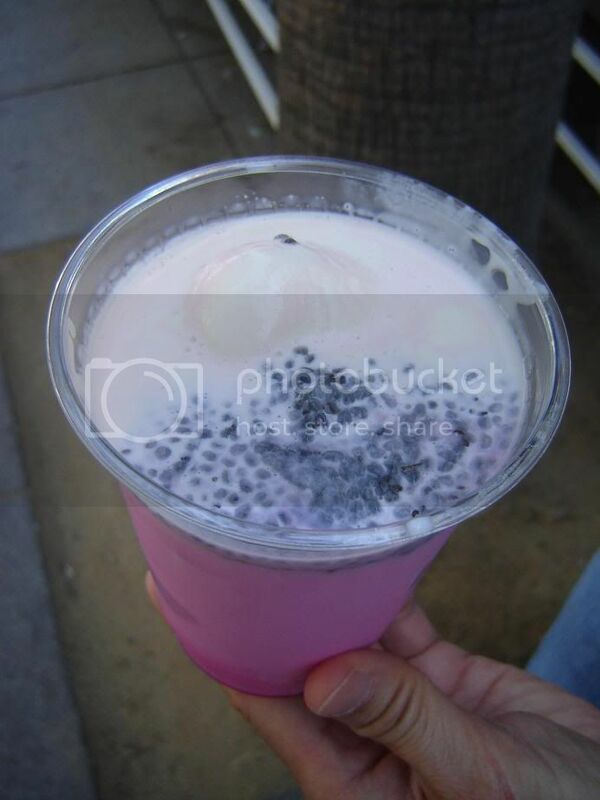 This particular one is made with milk and rose syrup, and tapioca seeds, then served with a dollop of ice cream. Talk about Sweet. This was actually too sweet and too ... fragrant ... for my taste. You can really 'taste' the fragrance of the rose syrup. I liked it enough and drank about 1/3 of it but I was also already really full from all the food and couldn't finish it. Anyway, it was a pretty interesting festival, with a lot of new and interesting food (for me), plus it's free and right on the promenade, so if I'm free next year I may hit it again. CozmoDeck: May Be A Good Deal! Missing Laksa in LA ...Out of Luck?